You must hold a valid West Virginia driver's license to operate a motor vehicle on public roads. These documents also come in handy as valid photo identification. You've never held a driver's license. Your out-of-state driver's license is expired. Your WV driver's license has been expired for longer than 6 months. If you're a teen driver, you must go through the state's Graduated Driver Licensing (GDL) system. Visit our page on applying for a new license as a teen to learn more about Level I and Level II instruction permits and how you can upgrade to a full driver's license. The West Virginia DMV issues federally-compliant REAL ID driver’s licenses, which allow you to use your license for domestic travel and entry into federal and military buildings, in addition to standard driver’s licenses. You can choose to apply for EITHER a REAL ID or a non-compliant license—the process varies slightly for each. Details are outlined below. You can transfer a valid out-of-state license within 30 days of moving to West Virginia. Surrender your valid out-of-state license**. If you don't have your license, you can either check your state's procedures for getting a duplicate license OR submit a certified driving record from your previous state dated no more than 30 days from the date of application. Complete a brief alcohol awareness course. Written and road skills tests if your out-of-state license is expired. These will vary depending on if you want a REAL ID—a federally compliant card which will allow you to board domestic flights and enter federal facilities—or a non-compliant ID. See Apply for Your WV Driver's License below for steps and details. Pay the applicable fee (see Drive for Five: License Fees below). Immediately, if you choose a license marked “Not for Federal Identification Use." By mail, if you choose the REAL ID-compliant license marked “Federal Identification Use." The DMV will give you a temporary license good for 60 days; your permanent license will arrive within 15 business days. Learn more about secure licensing and the REAL ID Act under Apply for Your New WV Driver's License below. You will not receive a West Virginia driver's license if your out-of-state license is suspended or revoked until you satisfy your former state's reinstatement requirements. At such time, the WV DMV might require you to present a clearance letter from the National Driver Registry's Problem Driver Pointer System (PDPS). What do these mean? We'll explain below. A nonresident who is at least 16 years old and has a valid out-of-state license. This exemption is limited to 90 days. A nonresident WV college or university student with a valid out-of-state license. An active-duty military member performing official duties. You're illegally in the country. You can't provide the required documents for application. You habitually use alcohol or have a drug addiction. The DMV Commissioner has reason to believe you would be dangerous to others when operating a motor vehicle. Applicants 18 years old and older who've never held a driver's license must obtain a Class E Instruction Permit. This permit is not affiliated with the GDL program. You'll apply for your West Virginia driver's permit in person at your local DMV office. Call ahead for appointment information. Submit a completed Application for a Driver's License or Photo ID (Form DMV-DS-23P). An original Wage and Tax Statement (W-2) form or paycheck stub that includes your name, address, and SSN or employer identification number. A 1099 form with your name and SSN. Certified marriage certificate or divorce decree. Court order showing your name change. Utility bills no more than 60 days old; vehicle registration card; mortgage or rental documents, etc. Bank statement, car insurance card, paycheck stub with your physical address, etc. Once you pass your exams, you'll receive your Class E learner's permit for $7.50. Give yourself the best chance to pass your permit test on the first try. 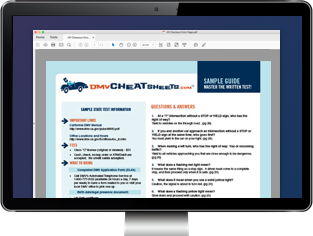 Take a couple of online practice tests before you head to the DMV! Use this permit to practice driving with another licensed driver who is at least 21 years old and sitting in the front passenger's seat to prepare for your driving test. The permit is valid for 90 days—but you must keep it for at least 30 days before you can take your driving test. Once you've had your permit for at least 30 days, you'll be eligible to take your road test and apply for your full driver's license. A regular passenger vehicle in good working condition with a valid state inspection sticker. Proof of your vehicle's registration and insurance. Immediately, if you choose a non-compliant license marked “Not for Federal Identification Use." By mail, if you choose the REAL ID-compliant license marked “Federal Identification Use." This may be used to board domestic flights and enter federal facilities. The DMV will give you a temporary license good for 60 days; your permanent license will arrive within 15 business days. In accordance with the Real ID Act of 2005, West Virginia requires a higher level of security when issuing driver's licenses and identification cards. The requirements for non-compliant and federally-compliant licenses are essentially the same for new applicants—the differences come with renewals and duplicates of previously issued non-compliant licenses. “Not for Federal Identification Use": You'll get a standard driver's license or ID. It CANNOT be used as ID to fly or enter federal facilities. You'll receive this card immediately. “Federal Identification Use": You'll get a card marked as such and with a gold star. This card acts as identification for access to federal buildings and other government-related matters, as well as to board domestic flights. You'll receive a temporary card good for 60 days; your permanent card will arrive via first-class USPS mail within 15 business days. Your DMV agent will thoroughly explain the “Federal Identification Use" cards to you and help you decide whether it would benefit you to get one. Visit the West Virginia DMV's Secure Licensing FAQ for more information. West Virginia implemented a “Drive for Five" program, which—simply put—means your driver's license expires every 5 years on your birth month of an age divisible by five. License fees are initially prorated, and will depend on factors including your age and licensing period. For example, your driver's license will expire when you're 25, 30, 35, etc. Many drivers have to be worked into the “Drive for Five" program, meaning license fees initially are prorated and depend on factors like your age and how long you'll have the license before it's time to renew (on a divisible-by-five birthday). You can determine your fee using the Division of Motor Vehicles fee chart. The West Virginia DMV provides a thorough list of required and acceptable documents; below are some examples. INS Form I-94 OR a foreign passport with a temporary I-551 stamp. INS Form I-327 (valid re-entry permit). Valid foreign passport (English translation). All original INS documents verifying status and length of stay. U.S.-issued visa IF you're from a country whose citizens must obtain a visa per U.S. law. Status F-1 or F-2: You must provide written verification of school attendance on Form I-20, no more than 20 days old. Status H1-A, H1-B, H-3, or H-4: You must provide written verification from your employer, no more than 30 days old. Status J-1 or J-2: You must provide a Form D52019 and written verification from the school or employer listed on the form, no more than 30 days old. INS Form I-94. Must include refugee status. Reception and Placement Program Assurance Form. A written identity- and residency- verification form. Must come from an employee of the organization sponsoring you, and the organization must be approved by the U.S. Department of State. 2 documents showing proof of WV residency. A I-766 Employment Authorization Document.